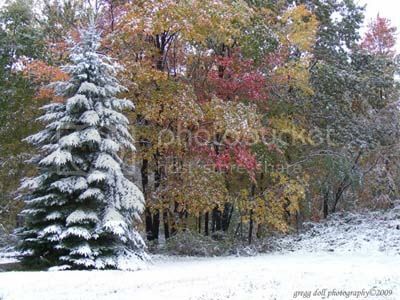 30 October 2008 was our first major snow last year. We are 15 days ahead of schedule this year as we got snow last Friday-Saturday. This week we are enjoying Indian Summer. If this year is anything like last year, we will be seeing a lot more snow before the end of the year. 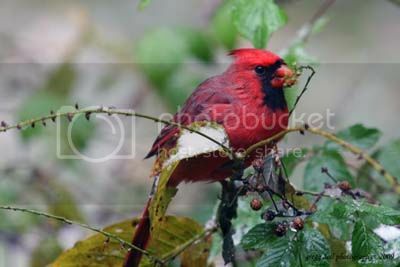 A Male Cardinal eats seeds as the first snow fall of the year hits the mountains and ridges of the Laurel Highlands of Western Pennsylvania. 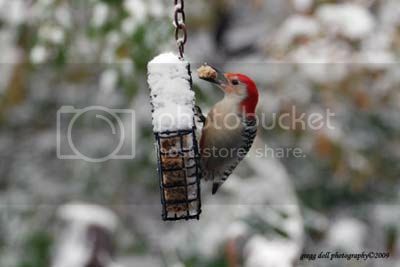 Male Red-bellied Woodpecker should get a lot of energy out of this ball of suet. 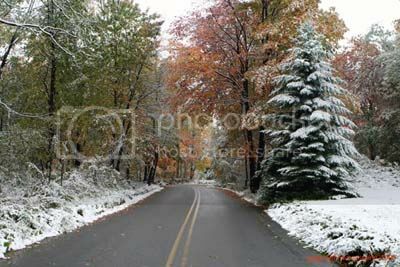 This is what the road in front of our house looked like late Friday morning in the early October snow. 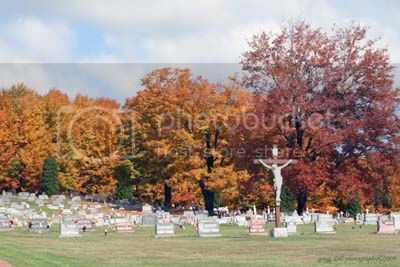 One of the reasons I enjoy photography is it captures the changes that occur around us everyday. 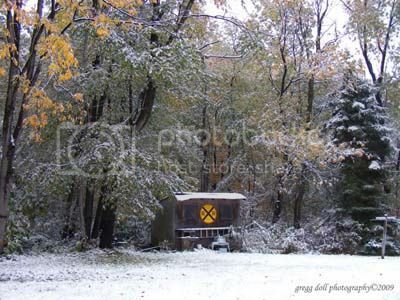 So, just like with the shed shot, this scene has been on the blog before, but it's never the same. The last time you saw it there was no snow. The leaves were there and the color was brighter. Now the color is more subdued. The snow has changed everything. 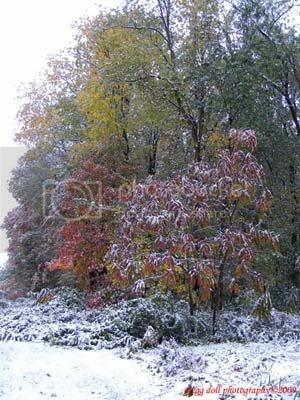 A sumac along the edge of our yard stands out in the fall snow. The birds and deer enjoy fruit from this tree during the winter. 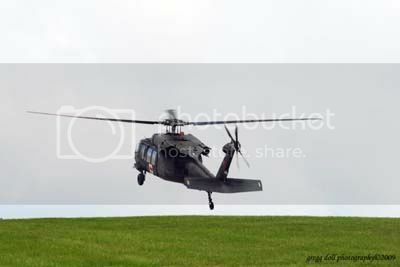 A U.S. Army Medivac helicopter makes a practice landing at the very end of the airstrip at the John Murtha Johnstown-Cambria County Airport. The airport is home to units of both The Marine Corps and the Army helicopter squadrons. As soon as I heard the sound of the helicopter, I knew it was a medivac helicopter. Flashbacks to Vietnam. 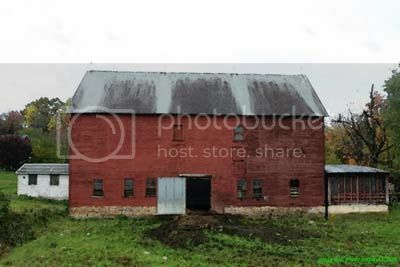 Located near the Airport is this red barn that I've seen from Route 219 but I'd never driven on Solomon Run Road in front of the barn until Sunday. 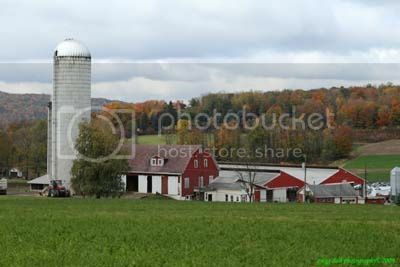 Cambria County dairy farm nestled in front of the fall colors on the distant hills. 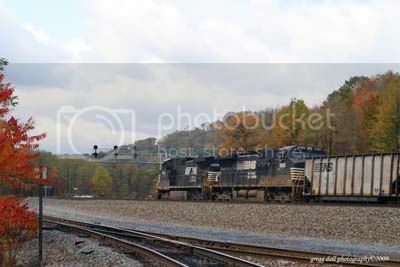 One of the favorite spots for train watchers in this area is South Fork. At this particular time all of the west bound tracks were closed.. Seems like no matter what kind of road you are on, there is always a red light waiting to slow you down. 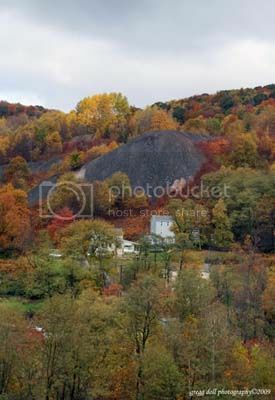 The boney pile is framed by the brilliant fall colors. 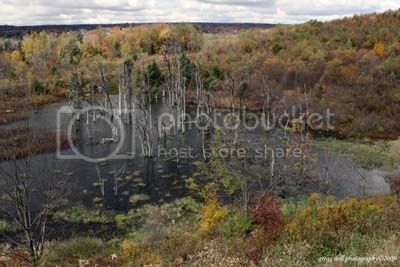 Pond located along Route 219 South where it cross Route 422. Looking toward Revloc. 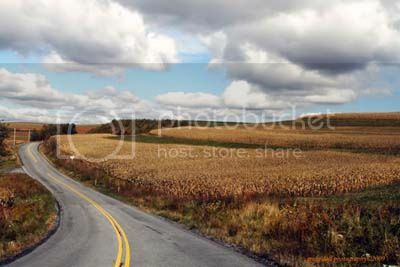 Corn field along Ridge Road, East Carroll Township, Cambria County, PA heading toward Hastings, PA.
St. Bernard's Cemetery, Hastings, PA. 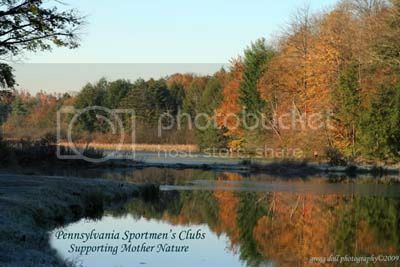 These shots were all taken at the Cresson Sportman's Club. 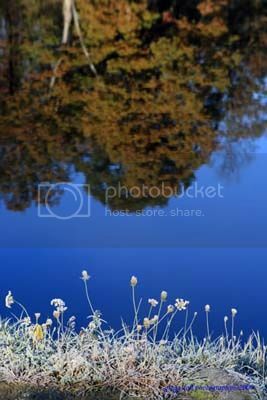 Reflection on the Cresson Sportsman's Club Bass and Trout Pond. 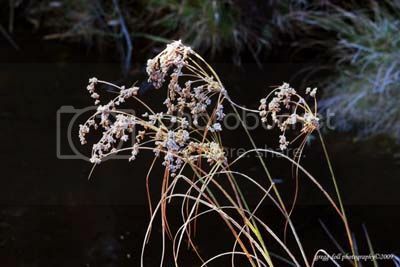 Weeds coated with an early morning frost. 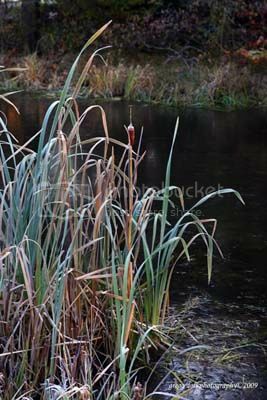 With the trees on the opposite shore reflected in the water, the white of the frosted coating on the plants stands out against the contrasting bright blue of the Sportsman's Club pond. 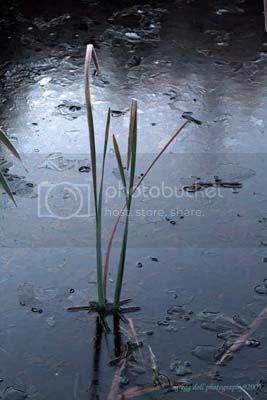 The surface of the water is showing the first freeze of the year. 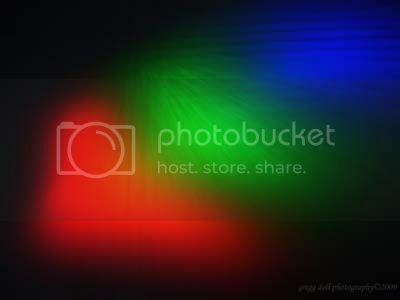 Our last three pictures this week were done using the colors created by a multi-faceted glass prism that hangs in our bedroom window which refracted light upon two separate surfaces. The final images shown here were created by using various filters in PhotoShop. The original of this photograph was nothing to write home about. But, by taking a few minutes and experimenting with some basic adjustments in PhotoShop, I was able to obtain this result. 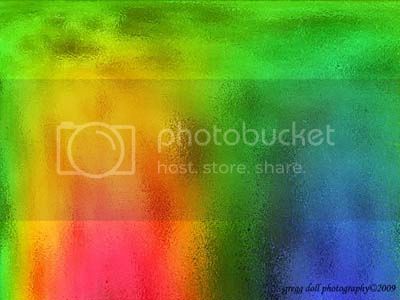 The photo started out with the rainbow shining on a dresser top in the bedroom. 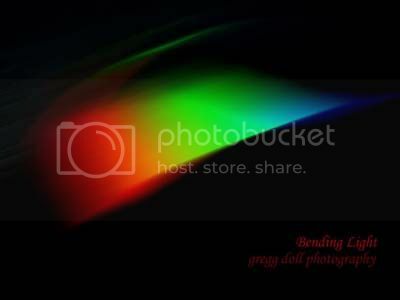 This image is of the rainbow showing on the rug. Because of the texture of the rug, the effect is more blended, subdued, subtle, than the effect from the image on the hard dresser top surface. The effect here is like you are looking at the colors through frosted glass.